To Fix it or Replace it? One of the things we always do when we go to the States (or, should I say many of the things we always do) is go shopping for clothes. Clothes are easier to find in the United States than in France, for me at least, and are much cheaper especially when you go to thrift stores. Prior to this trip we (I) made a mental list of all the things I wanted to try to find on our trip; stuff for the kids (pyjamas, pants) and new work clothes for me. High on the list was also a wardrobe refresher for my husband. Like many men, shopping is just not his thing and although he was getting tired of many of the items in his closet, it had been about 18 months since he had bought anything new. It wasn’t just that he was getting tired of his clothes however- many of his clothes were getting tired of him! I remember reading books like Little Women, or the Laura Ingalls Wilder books, about all the measures people used to take to preserve the life and longevity of their clothes. Rips were mended and buttons replaced. Hems were taken up or let down, seams were taken in or let out, collars and cuffs were turned. Old clothes were turned into quilts if possible or rags if not. Some of these things still happen today, of course. I sew on buttons, or take up and let down seams. My children’s former nanny quilts. (If she can’t turn fabric into a quilt she’ll even toss it on the compost heap!) But other repairs that were once very common- turning the collar on a men’s shirt, for example- I wouldn’t even think of doing. So, this morning as I was putting away the many piles of laundry that have accumulated since unpacking our bags, I went through my husband’s and children’s clothes with an eagle eye. 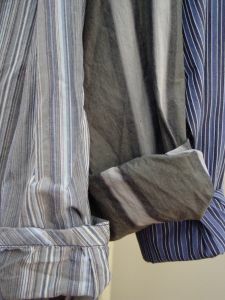 Frayed collars or cuffs? Gone. Ripped knees? Gone. Stains set? Gone, gone, gone. I know that once upon a time we would have found a way to reuse or repair these things. And it surely says nothing good about our modern consumer mentality and my own frugal ways that I’m not trying harder to do just that. But on the other hand, I think that life is sometimes a bit too short- and busy- to try. What clothing repairs do you do? What will make you toss or replace something? Putting buttons back on for sure, and fixing tears if they’re at the seam. If it’s a pair of jeans and they tear across the fabric they turn into renovation clothes. I’ll hem a pair of pants or take in a seam, but usually the clothes wait in a pile a while before I actually do it. I have darned a pair of socks before, but they were very thick knitted socks and they had some nostalgia value. Usually I just buy new ones. I’ve never fixed the tips on my own heels, but I read about how to do it on the smart cookies website. It may be time to add that one to my repertoire. Well, I just got a sewing machine for Christmas, so I’ll probably be doing more repairs of clothes… if they’re pieces that I really like. But even for non-sewers, if a hem goes out or something, there are so many sticky products out there that can keep it in place (Francesca’s Collections sells stuff like this). if something gets pilled the least little bit, I don’t want to wear it anymore. so my focus is on finding clothing with fabrics that are not subject to pilling. wish me luck! Have you tried those clothing shavers? I have one and it works great. I even “shaved” my favorite cashmere sweater from a bit of pilling. Be careful though to make sure it is completely flat. If you shave over a bump you can cut a hole right in the material. try one that is like a pumice stone… works great for knits like t shirt material and use it all the time for kids clothes that get washed so much and handed down. After a few minutes pills are gone and hand me downs are something i am not embarrassed to send them out in. It really comes down to time vs money. I do know how to make minor repairs, but really don’t have the time to devote to this. I have to weigh the cost of having someone else sew on buttons, etc., versus spending a little more buying new. We are a family of 5 plus a live in friend. I homeschool, public school, take care of the household, and am on the board at church, so my time is very scarce. Our monthly clothing budget can usually accommodate a few dollars in this direction. Sometimes it’s worth it to just buy a new one. Yup- that’s kind of how I lean too. I get very attached to pieces of clothing, so if there’s damage on an item (no matter how small or big) that can be repaired (no matter how easy or difficult), I’ll do it. I’ve got a pair of jeans I’ve had since 1998, still going strong, with just a few barely visible frays fixed, and some pairs of socks that are as old. If it’s something that I think I can’t nicely repair myself, I’ll either take it to mum who can, or if mum can’t, then I’ll take it to the mending shop right around the corner. Most of the time it’s way cheaper than getting something new. And when the clothing is no longer fit to be worn in public, I’ll wear it around the home. And when it’s not even good for that, then I’ll deconstruct it to use as possible patches, cleaning rugs, or something vaguely crafty. I read that even the Prince of Wales used to have his collars and cuffs turned by the royal seamstress, but they stopped doing it, since the price of hand sewing is more expensive than replacement of a shirt. I just confronted this issue myself this week with a ski jacket and a pair of high-heeled black shoes. The ski jacket’s main zipper pull has broken. I needed to use a trick to get it to go up or down. The shoes were getting badly scuffed. However, I chose to repair both of them, each for $25 dollars. I figured a new jacket would be over a hundred, and even though the shoes weren’t expensive when I bought them, they fit, are broken in and don’t give me blisters, and I really like them. So I figured it was worth my time to get them repaired rather than trying to find something new, which would take a long time b/c I’m picky! My mom does some sewing, so she’s repaired frayed cuffs and hems on sweatshirts and jeans recently, so you don’t notice the damage unless you look closely. But at some point I’ll need to get new ones. love the web page with the comments.. Recently I have repaired the seam of my daughter’s basketball sweatshirt, the seam on the lining of a leather jacket and the hind end of a pillow pet panda. In the past I would have just gone out and bought new instead of going to the effort of repairing. My casual clothes have “stages” — Stage 1 is wearable in public, Stage 2 is wearable only around the house, Stage 3 the clothes are for yard work or painting only. Stage 4 — no longer covering the essentials so they go into the trash!